Nature has decorated her creatures in a range of beautiful colors, some colors signify danger; like red; while others signify a bad taste; like yellow and black. Blue is one of the lesser-seen colors, present only on a handful of spiders and more commonly on birds. When you do encounter a spider with blue markings, the contrast between its coloring and other body colors is particularly distinctive. The eye-catching cobalt blue tarantula (Haplopelma lividum), has a rich, almost metallic blue color most typically adorning the legs but sometimes covering the entire body. The tops of the legs are typically more radiant, with the color dulling toward the tips. While beautiful to look at, the cobalt blue tarantula is not to be handled by a novice, for the creatures are aggressive. The spider can grow up to 5 inches in diameter, including legs. The creature is native to Southeast Asia. The Sazima’s tarantula (Pterinopelma sazimai), native to Brazil, is actually a victim of his own beauty. Numbers of wild specimens are dwindling due to a combination over-collecting for the purposes of private keepers and habitat destruction. 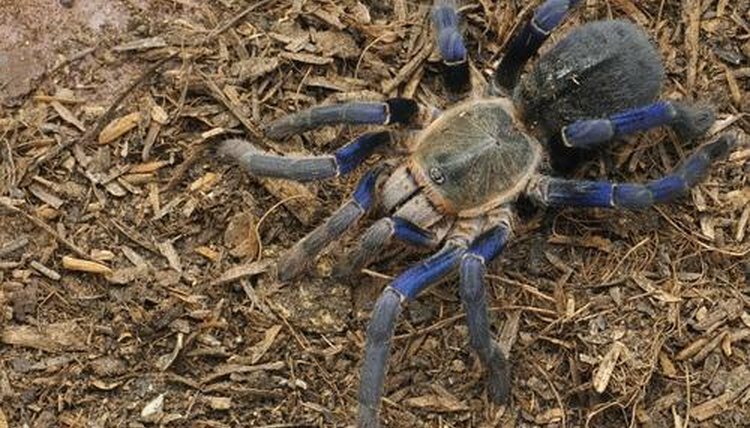 This tarantula is a deeper, less vivid blue than the cobalt blue but no less distinctive. The blue markings, typically covering the legs solidly, are a consistent intensity from top to bottom. The Sazima’s tarantula’s abdomen is dull brown with red markings. Native to Australia, red-headed mouse spider (Missulena occatoria) males typically have light blue markings on their abdomens, enabling easy distinction between genders. As well as blue markings, the male mouse spider has a red head, making for an exciting contrast of colors. The legs are black. Easily one of the most distinctive and unusual spiders on Earth, the happy face spider (Theridion grallator), a Hawaiian native, grows to less than a half-inch. His small size is barrier to deterring predators. This harmless spider has evolved a patterned underside, often resembling a smiling face. Scientists believe this pattern, often featuring blue markings, is used to confuse predators. The daring jumping spider (Phidippus audax), native to the United States, has iridescent chelicerae, typically metallic-blue or -green. These are the mouth parts from which the fangs hang. These spiders are capable of jumping 50 times their own height. A male will jump if a female gets too close during mating. Australia's wolf spider, so named due to a mistaken belief that the creature hunted in packs, is typically black or brown all over, but the egg sac the female carries throughout has a light blue tint. To the untrained eye, the egg sac can appear to be part of the spider's abdomen. Another striking feature of the wolf spider is the array of eight eyes.